As of August 10, the iSchool has moved its Resources website (previously resources.slais.ubc.ca) into a new UBC Faculty of Arts platform (lais.air.arts.ubc.ca). The new site can be accessed using the links below, or by visiting the Resources section. Please note students do not need to login to view the website. Find information, policies, forms, guidelines and more, for: managing your program, courses and registration, money and employment, technology resources, or on-campus resources. 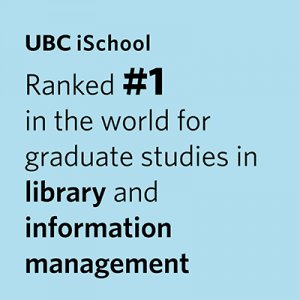 For questions related to the new site, contact the Marketing and Communications Manager at ischool.comms@ubc.ca.